In a move reminiscent of a dictatorship rather than a global nation, the US is warning of sanctions against any company or country that assist in any way an Iranian airline or allow it into their country, including its allies in Europe. The US Government has instigated sanctions on a travel and ticketing agency in Malaysia that has been providing ticketing and reservations services for Iranian carrier Mahan Air for over five years. The company, Mahan Travel and Tourism, has now had all its property, interests and investments in the USA's jurisdiction blocked. And, according to the US Treasury, that jurisdiction is pretty vast and "this is only just the start, this action against is a warning shot, There is definitely more to come." warned Marshall Billingslea of the US Treasury. Mahan Air has a mixed fleet of mostly Airbus aircraft, including A340's and A300's and operates many routes, including over 40 international destinations this year. 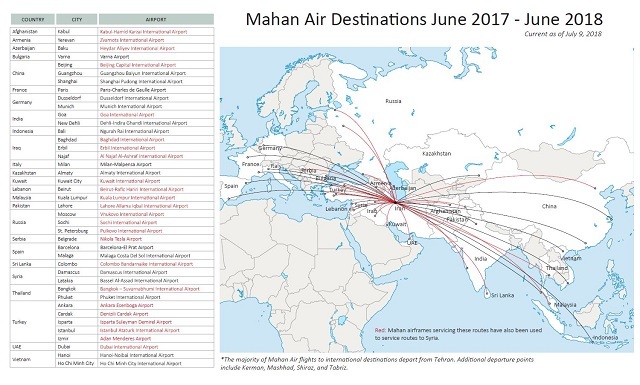 The US Treasury released a route map of what it says are places Mahan Air has served including destinations in Afghanistan, Bulgaria, China, Germany, India, Italy, Kuwait, Lebanon, Pakistan, Russia, Serbia, Spain, Thailand, Turkey and the United Arab Emirates. 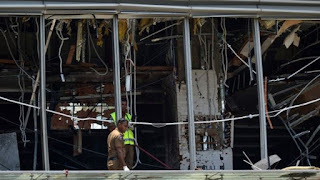 "All of them are of great concern to us," Marshall Billingslea told select media organisations, asserting that routes into Europe were "highly problematic"
According to Marshal Billingslea, the US is determined that Mahan Air flights into countries allied with the USA will be "terminated" which they will do either by economic means or through action by governments or airports. The US could and would impose sanctions on European countries, airports, suppliers and government, "Any company that continues to transact with Mahan [Air] is doing so at great financial risk," the Marshal briefed trade publication FlightGlobal. Warning that the US government knows the airports, the fuel, maintenance, cargo and catering services that are used by Mahan Air and all are at risk of sanctions and similar blocks to those imposed on the Malaysian travel services provider. "Companies, particularly Western companies operating in NATO nations, need to protect themselves and shut down their business ties" Bilingslea warned. The US Government says that Mahan Air has carried personnel and supplies for groups like Hezbollah and the Islamic Revolutionary Guard Corps-Qods Force. The airline has also transported personnel and weapons to Syria claims the US Treasury, yet has so far refused to provide or share its intelligence and any independent corroborating evidence.